Let’s start the year off by going back to basics with a twist! 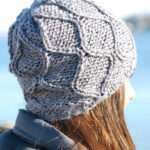 This beanie incorporates the ewrap knit stitch, as well as the knit stitch and the purl stitch. 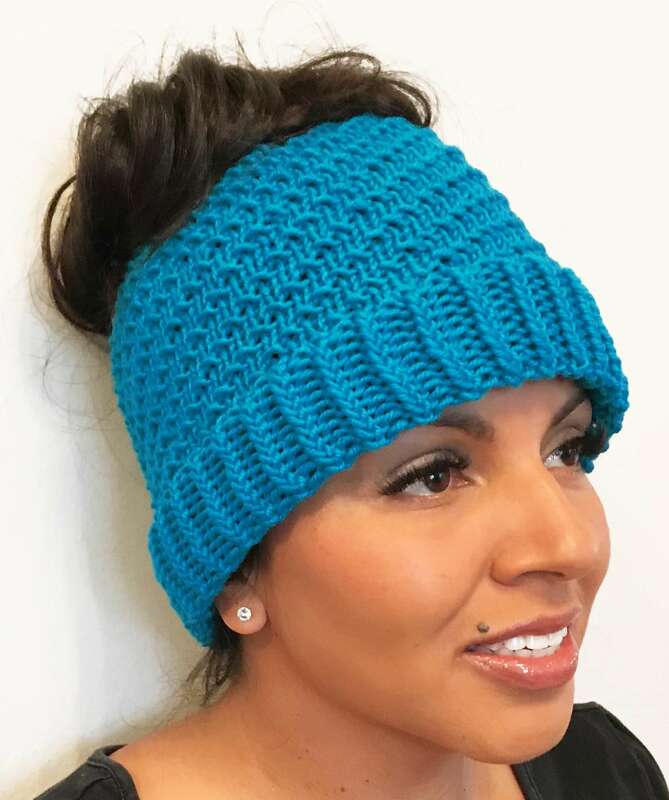 Want to be more chic, skip the cinching of the top and create a messy bun beanie! LOOM: White Hat Loom (72 pegs) from Premium Round Loom Set. SIZE: Fits head up to 21” in circumference. Cast on 72 sts, join to work in the rnd. Rnd 1-10: *ek1, p1; rep from * to end. Rnd 11: p to end of rnd. Rnd 12-21: *ek1, p1; rep from * to end. Rnd 22: Pick up cast on row and place the stitches back on the loom. K to end of rnd. Rnd 23: *k3, p1; rep from * to end. Rnd 24: k2, p1, *k3, p1; rep from * to last st, k1. Rnd 25: k1, p1, *k3, p1; rep from * to last 2 sts, k2. Rnd 26: *p1, k3; rep from * to end. Repeat Rnds 23-26 until item measures desired length (approx 7 inches from cast on edge). 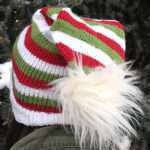 To create a regular beanie (top closed): Move every loop from every odd numbered peg to its neighbor (1 to 2, 3 to 4, etc.). 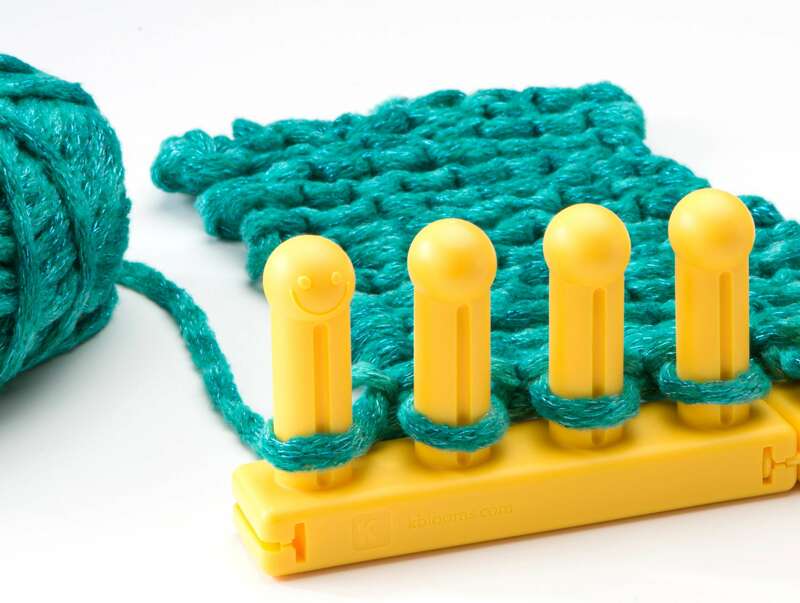 Once every other peg has 2 loops on it, bind off with basic bind off method. 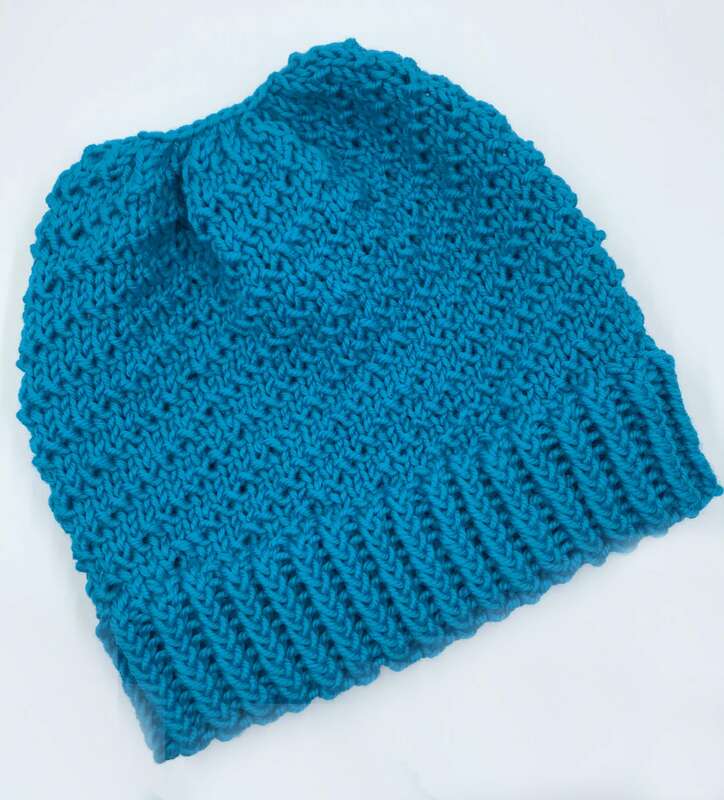 To create a Messy Bun Beanie (top open): Remove all the stitches from the loom onto a piece of contrasting color yarn. Single crochet close the opening by grabbing three stitches each time all the way around. Follow this link to a video demonstrating this step. Weave all ends in, block if necessary. The sample used the white loom from the Premium set–some would consider it regular gauge or small gauge. 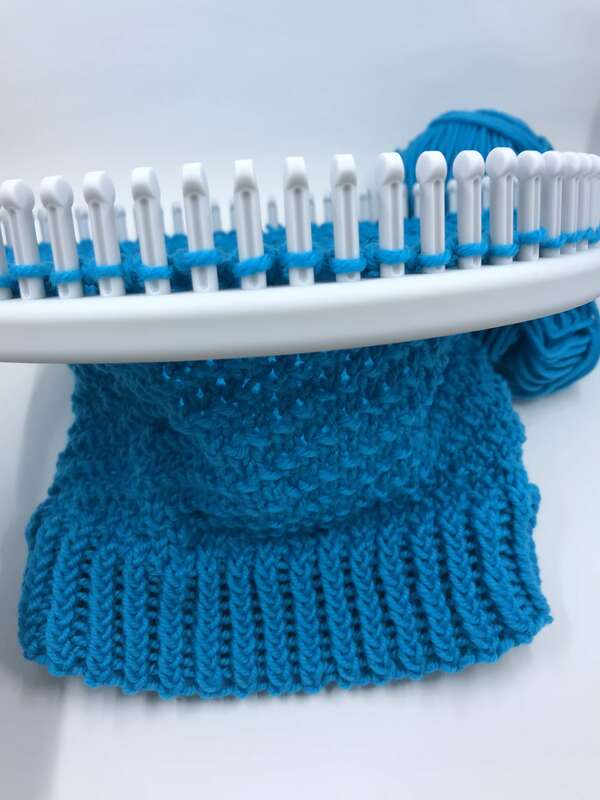 Were all knit stitches e-wrapped? No, only the ones on the brim. The pattern has these as “ek”. I believe Rounds 1-21.